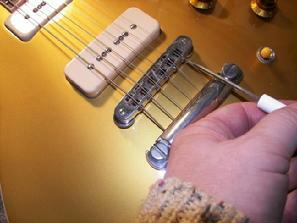 Repair and Set-ups are the specialty at Sloan Guitar Works. Get the most out of your Guitar! Customize your guitar and make it something YOU like. New Pick-ups? Tuners? Nut, Hardware? New Frets? New Neck? Save hundreds by supercharging yours. There is so much you can do!! Let your imagination run wild! Thinking About Changing pickups and Wiring configurations or adding a pup to your acoustic?? Take your pick. Nothing makes more of a difference to the sound of your guitar than new pickups. I am a big fan of Lindy Fralin pups for single coils, SUHR for humbuckers and singles, and of course, Seymour Duncan has a huge arsenal of pups to pick from. I discount my labor for installation of pups you purchase from me, so before you buy, be sure to give me a call. Get a new bone nut, or nut of your choice and a complete "Extensive Set-up" for only $120! That is a $10 discount off the regular price of $130. New Nut, Level, re-crown, and polish frets, straighten neck, create "fall away", intonate, clean guitar, adjust pickups.... The Works!! Make it play better than ever before. All this for only $120!! I am Mark Sloan, owner Sloan Guitar Works. I have been a working musician in the Lafayette and Muncie Anderson area for over 45 years and have been doing guitar repair work, customizing, building and modifying Electric and Acoustic guitars for almost as long. Doesn't it just make sense to have your guitar worked on and repaired by someone who plays professionally and understands the needs of a the professional guitar player? 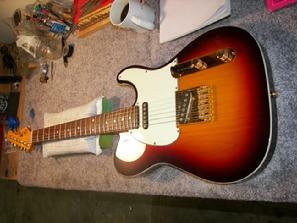 Sloan Guitar Works can improve your playing by improving your guitar! Learn what guitarists from Lafayette, Monticello, Delphi, Crawfordsville, and Northwest Indiana and Central Indiana including Anderson, Muncie and Alexandria have already discovered, when you want the best in guitar repair or you just want "someone who knows" to make your guitar play like the Pro's call Sloan Guitar Works. Now Specializing in Custom Finishing - Make your guitar unique. I use only Nitrocellulose lacquer, the best finish for tone and looks. Get rid of the tone robbing polyester finish most guitars have today and go with the best finish for stringed instruments, NITRO baby!!! Toll Free number you can call from anywhere. Call 765-807-2410 and be sure to leave a message if you get a recording. Go to our Facebook page for lots of great examples of the work we do here. You may even see your guitar if you are a customer. Please be sure to leave a comment if you like what you see. Thanks!